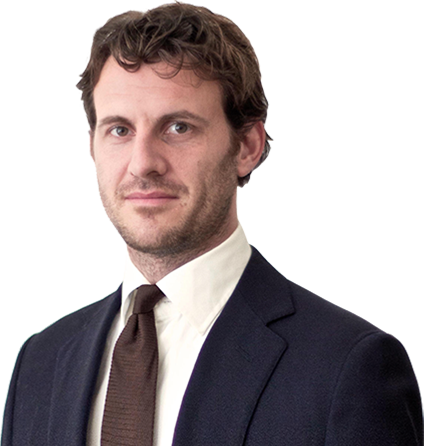 On April 4, 2014 Alasdair Macleod published an extensive analysis on the Chinese gold market. I felt obligated to respond to it by sharing my point of view and explain where I disagree with his analysis. I think his estimates are largely overstated because he double counts certain demand categories. He states Chinese gold demand in 2013 was 4843 metric tonnes, according to me it was 2197 metric tonnes (my estimate excludes some hidden demand and PBOC purchases on which I have no hard numbers). Setting out our differences was incidentally a good occasion for me to write another in-depth analysis on the Chinese gold market. For all clarity please note I make a clear distinction between deliveries and withdrawals since a couple of months, as they do not relate to the same data. The SGE uses the term deliveries inconsistently which has caused for confusion. Let’s go through the aspects of the Chinese gold market in random order; PBOC demand, the SGE, domestic mining, mainland net import and Hong Kong trade. Macleod states all Chinese domestic mine supply is soaked up by the PBOC, according to my analysis this is not likely to be the case. – Owning hard currency as the cornerstone of capitalism. – Owning reserves that protect the Chinese economy from external/internal shocks and inflation. – Owning reserves that are not controlled by a foreign nation (the US). 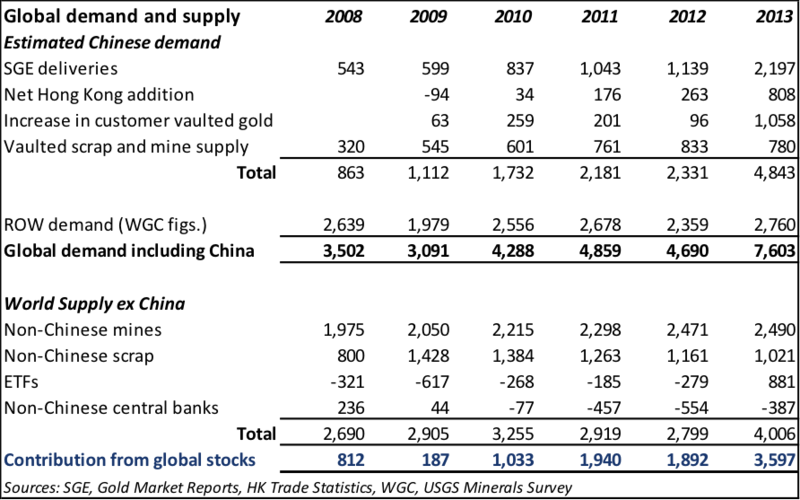 – Diversifying its excessively large USD reserves prior to an irrevocable USD devaluation. 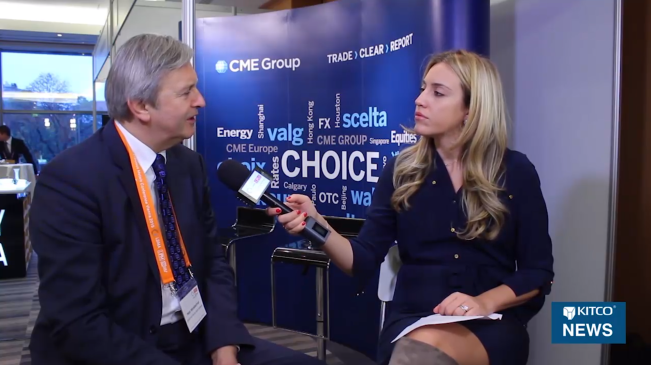 – Hedge their exorbitant USD reserves. In my opinion the PBOC (or its proxies SAFE and CIC) does not purchase gold from domestic mines or from the SGE. The PBOC’s incentive is to exchange USD’s for gold, preferably buying undervalued gold with overvalued dollars. 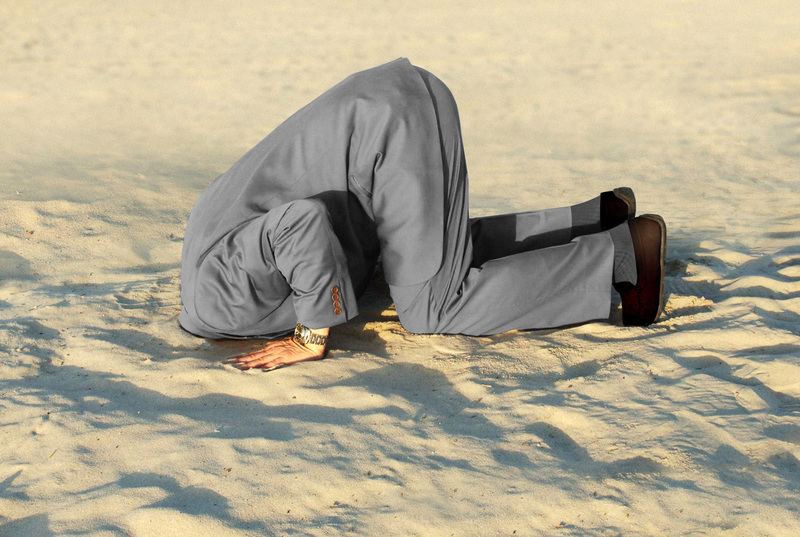 Hence the PBOC buys in utmost secrecy, not to affect the market. It wouldn’t make sense for the PBOC to buy gold from domestic mines because they would have to pay in RMB. This wouldn’t fit all their objectives mentioned above. 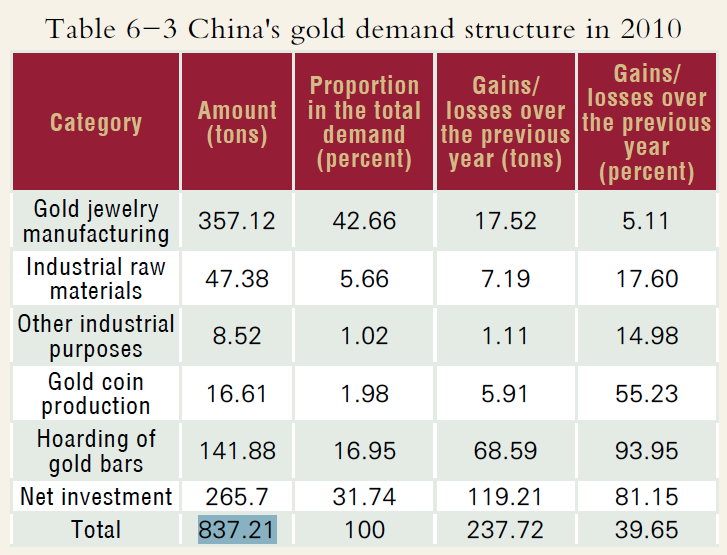 Additionally Chinese law dictates all domestic gold mining output is required to be sold through the SGE (page 15). Last, I personally have never come across any evidence the PBOC has bought domestic mine supply in recent years. In April 2001, the governor of the PBOC announced the abolishment of the gold monopoly with a planning management system. 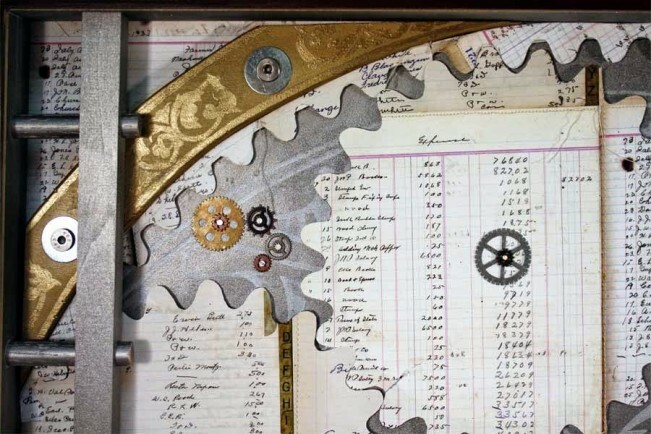 In June of that year, the weekly quotation system for the gold price officially came into operation, which adjusted the domestic gold price in accordance with the price on the international market. The Shanghai Gold Exchange (SGE) officially opened on 30 October 2002, representing an important breakpoint in the revolution of China’s gold system, and reflected the great progress being made. After the PBOC abolished the monopoly on gold allocation and management, the SGE assumed the basic role of allocation and management of gold resources, stipulating the healthy and orderly development for gold production, circulation and consumption. When the SGE was launched in 2002, the gold market wasn’t liberalized overnight, as one can imagine. It took a couple of years before the market functioned as the PBOC had intended. The intensions were, inter alia, to let the free market set prices and all imported and mined gold was required to be sold first through the SGE. 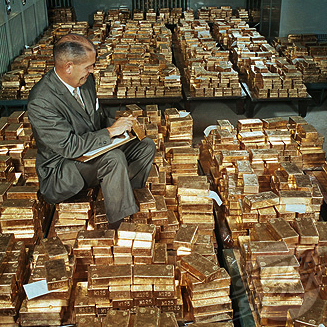 The reason to channel fresh gold (import and mine supply) through one exchange is to keep track of the gold added to non-government reserves (jewelry, bar hoarding, institutional buying, etc). By requiring all fresh gold to flow through the SGE the PBOC can efficiently supervise the quality and quantity of the gold that enters the Chinese market place. The PBOC wants to know exactly how many grains of fine gold are being held among the people. Additionally scrap gold is allowed to be sold through the SGE, but because this type of supply doesn’t affect reserves, it isn’t required to be sold through the SGE (it doesn’t have to be monitored). The structure of Chinese physical gold market with the Shanghai Gold Exchange at its core entails SGE withdrawals equal Chinese wholesale demand. 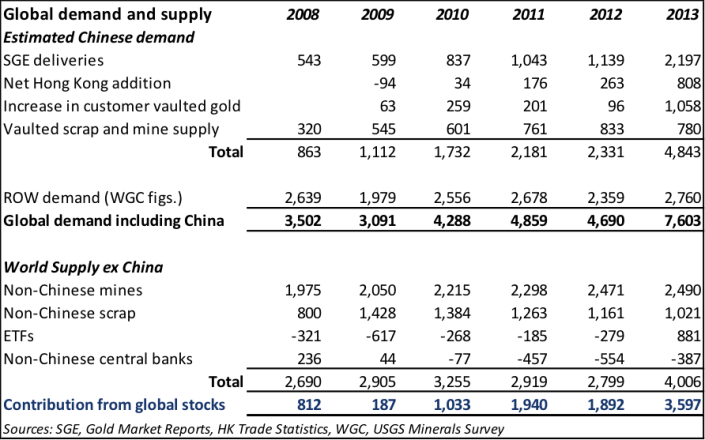 This has been published by the SGE Annual Reports, China Gold Market Reports and CGA Gold Yearbooks 2007-2011 (I’ve written and extensive analysis on this theorem which you can read here). Unfortunately only a fraction of all these reports is publically available; if you study the rest and gather all bits and pieces you can make an informed analysis. Through analysing data from 2002 to 2011, after 2011 the Chinese were reluctant to publish reports as this information became too sensitive, we can clearly see how the SGE and the Chinese gold market have developed. The next table is from the China Gold Association (CGA) Gold Yearbook 2006. Exhibit 1. The number circled in yellow is a typo (see exhibit 2). Exhibit 2. I corrected the typo. Whilst we can see that SGE withdrawals grew from 2002 to 2006, moreover the table exposes SGE withdrawals grew relative to total supply. Exhibit 3. The number circled in yellow I know for sure is a typo because I cross-checked the number with two other reports. 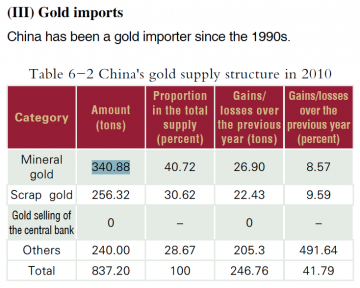 In 2007, the amount of gold withdrawn from the vaults of the Shanghai Gold Exchange, gold demand of that year, was 363.194 tonnes of gold, compared to 2006 increased by 48.02 percent, 8.82 percentage points lower than the growth rate of supply. It states domestic mining output in 2010 was 340.88 metric tonnes, 40.72 % of total supply, net import (others) was 240 tonnes and total supply was 837.20. My point being, I think all this clearly exposes Chinese domestic mine supply is being sold through the SGE, not to the PBOC. 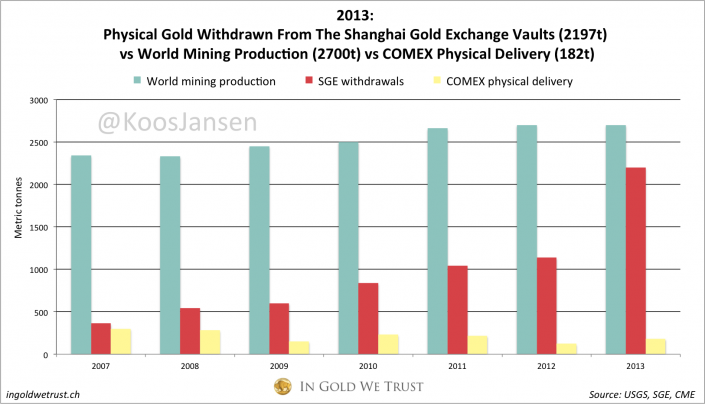 Does the PBOC purchase gold on the SGE? I don’t think so because all physical gold on the SGE is quoted in RMB and, again, it wouldn’t fit the PBOC’s objectives mentioned above to exchange RMB for gold. On top of that I have several sources in the mainland, including a teacher in economics and the gold market at the Henan University of Economics and Law in Zhengzhou City, that all tell me the PBOC would never buy gold on the SGE. Commercial banks like ICBC do offer a few trading products in USD, but these do not incorporate physical delivery/withdrawal. These products merely offer Chinese citizens and businesses more trading flexibility. Exhibit 9. From the ICBC website about USD precious metals account. The PBOC (or SAFE) is more likely to make gold purchases overseas in exchange for USD; this way they can fulfill all their objectives. It’s not hard for the PBOC to do this without the shipments showing up in global trade data. The UK net exported 1425 metric tonnes in 2013, most of which ended up in China. 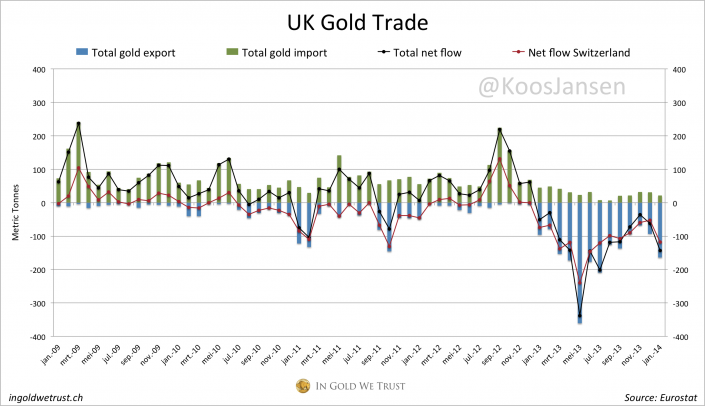 When looking at UK trade we should bear in mind these enormous amounts of gold exclude monetary gold. All data I gather from the SGE, UK customs, Switzerland customs and Hong Kong customs do not relate to any PBOC purchases (click here to see how much gold was exported from the UK, through Switzerland, through Hong Kong to the mainland in 2013). The amount of gold bought by Chinese consumers, investors and institutions I can make fairly good estimates for (it simply equals SGE withdrawals). My estimates on PBOC official gold holdings are pure guessing, based on common sense and anecdotal stuff (though it doesn’t take a rocket scientist to know the PBOC has increased it gold holdings since 2009, when it was last updated to 1054 metric tonnes). More on that later. In Macleod’s article there is much emphasis on SGE vaulting, though to my knowledge this amount is currently unknown. This is how the SGE works: SGE members make gold deposits, they sell this gold and the buyers have the option to withdraw the gold from the vaults. 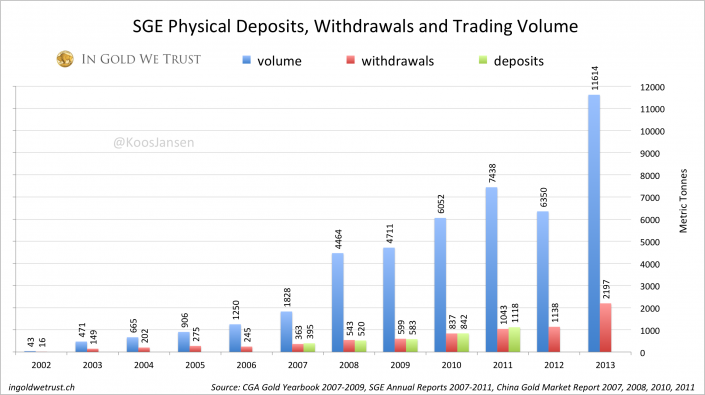 From the data I have we know yearly SGE deposits and withdrawals have been approximately the same from 2007 to 2011. Deposits can transcend withdrawals as some SGE account holders purchase Au (T+D) deferred contracts, perhaps later withdrawing the gold. Withdrawals can transcend deposits because there can be stock carry-over from previous years (see exhibit 4). The SGE does not own its own vaults. There are merely SGE designated vaults owned by, for example, commercial banks. Needless to say, SGE withdrawal data relates to physical gold that leaves SGE designated vaults. The next table is from Macleod’s article. Exhibit 14. Screen shot from Macleod’s article. Coloured boxes have been added by me. Exhibit 15. At the end of 2008 SGE inventory was increased by 8 metric tonnes. According to my analysis Macleod’s vaulted numbers are false and thereby his vaulted gold increase numbers, as presented as demand in the following table I took from his article. Exhibit 16. Screen shot taken from Macleod’s article. Additionally he adds vaulted scrap and mine supply to Chinese demand, while this is already included in SGE withdrawals (Exhibit 5, 6, 7, and this). This is double counting. The amount of net exports from Hong Kong to the mainland is clear. 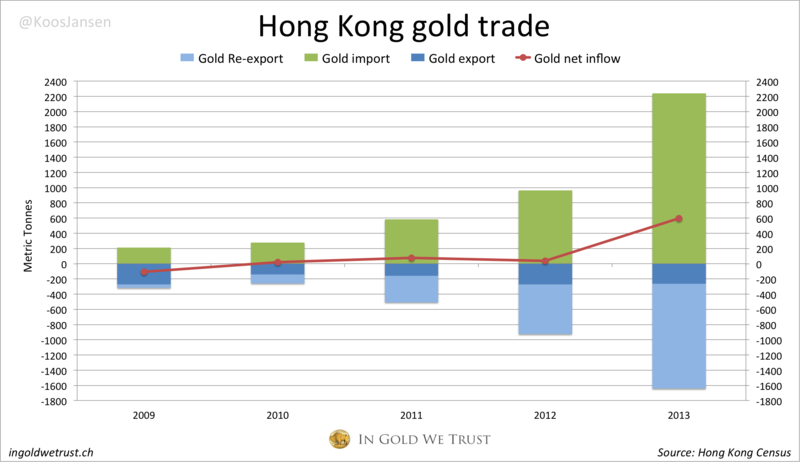 Very little of the gold imported by Hong Kong from the mainland was bullion withdrawn from the SGE vaults. A very long and complicated story short: In the mainland there are two types of trade; general trade and processing trade. General trade can be considered as normal trade. If gold is imported in general trade this is required to be sold through the Shanghai Gold Exchange. Only 12 banks have general trade licenses from the PBOC, though for every shipment they need anew approval. 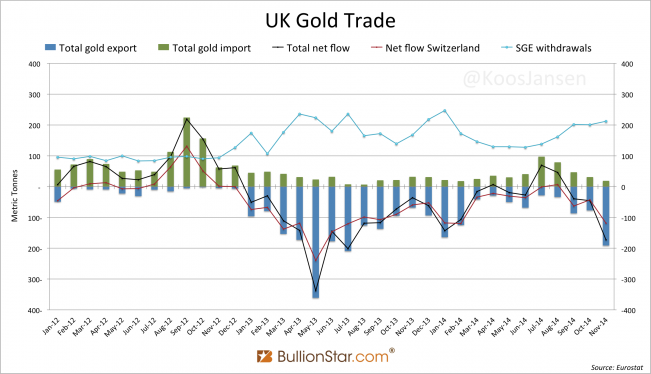 It’s not likely the PBOC would approve bullion gold to be exported in general trade. Additionally there are a few jewelry companies that have PBOC licenses, but these also have to ask for permission for every trade they conduct. The PBOC has a very firm grip on gold trade. Processing trade is something else. In this trade form raw materials from abroad are imported, processed into products and then these products are required to be exported again. 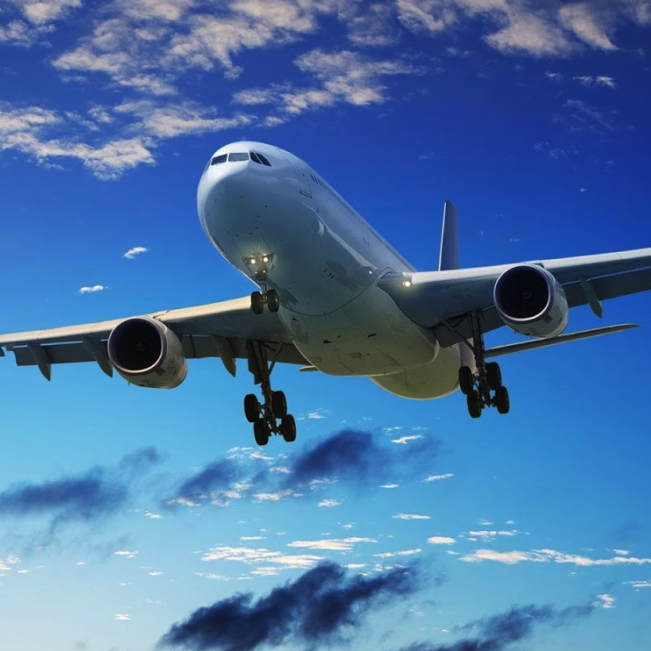 This processing is usually done (there can be exceptions) in Customs Specially Supervised Areas, or CSSAs. Processing trade doesn’t require a permit from the PBOC, as the gold that is imported will be exported after being processed. To export gold from a CSSA to a non-CSSA (that’s the rest of the mainland) a PBOC license is required. An example for a processing trade would be; gold from Hong Kong is exported to Shenzhen (a CSSA just across the border from Hong Kong and well known for its vast jewelry fabrication industry), then the gold is fabricated into jewelry and imported back into Hong Kong. This trade would show up in Hong Kong’s customs report, but it would not affect Hong Kong net export to the mainland. 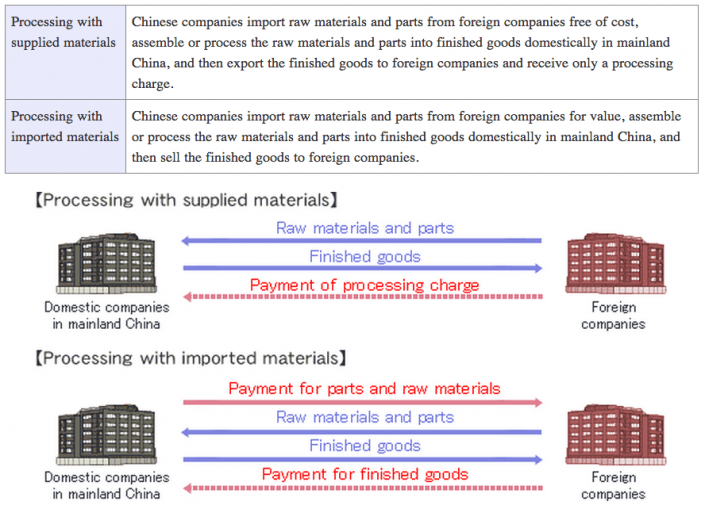 Processing trade explains the Hong Kong imports from the mainland. Most of the gold Hong Kong imports from the mainland is balanced by Hong Kong exports or re-exports to the mainland, as the PBOC is not likely to allow the mainland to export gold in general trade. 1) There is no evidence for this. Just because the gold is declared in Hong Kong as export doesn’t say anything about its shape or form. There are many refineries in Hong Kong, all capable of casting 1 kg bars to export to the mainland. 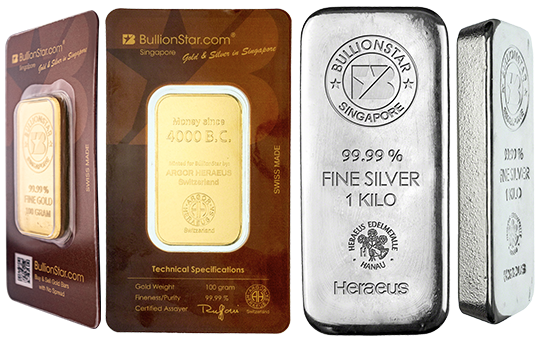 Hong Kong gold export to the mainland can also be 1 Kg bars destined for the SGE. 2) In China mainland there is a 22 % tax on jewelry (17 % VAT and 5 % consumption tax), these costs are added to the bullion and fabrication costs of the jewelry. This makes a 24 carat bracelet (most aunties buy 24 carat for investment purposes) of 100 grams much more expensive than the spot price of 100 grams of bullion on the SGE, which is free of VAT and consumption tax. Why would a Chinese jeweler fabricate its products in Hong Kong where wages are at least twice as high and then import them into the mainland? Assuming this company has a PBOC import license. It’s more likely Chinese jewelers buy bullion on the SGE in the mainland, the SGE has no vaults in Hong Kong, fabricate the jewelry and then sell it, all in the mainland. Macleod adds Hong Kong gold exports to the mainland (211 metric tonnes in 2013) to Chinese demand, I don’t. 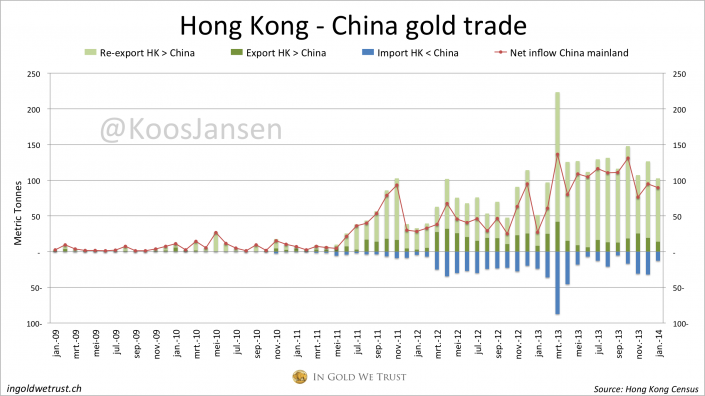 Additionally he adds total Hong Kong net gold import (597 tonnes in 2013) to Chinese demand. I don’t. We know some of the gold Hong Kong net imported in 2013 ended up in the hands of mainland citizens. Because in Hong Kong there is zero tax on jewelry, there are many mainland citizens making trips to Hong Kong to purchase jewlery and walk back across the border without being bothered by customs. 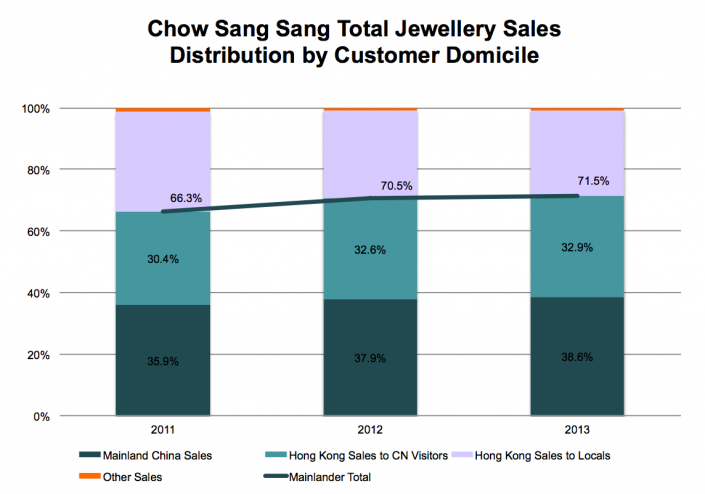 It’s estimated half of the jewelry sold in Hong Kong is bought by mainland tourists. There are also mainland citizen that purchase gold in Hong Kong and store it locally in safety deposit boxes at banks or private vaults. 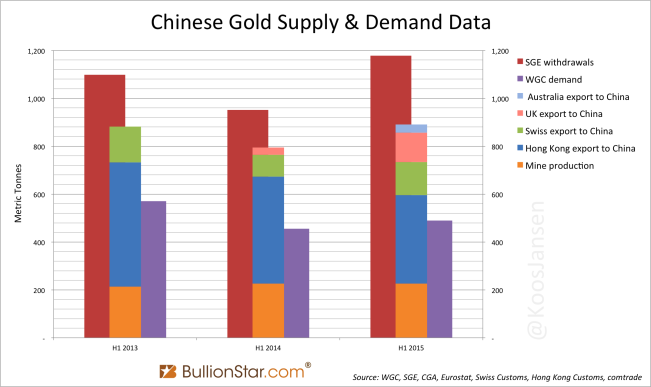 Unfortunately I don’t have any hard numbers on this hidden Chinese gold demand (yet). One could take half of the jewelry sales numbers from Hong Kong reported by the World Gold Council, but I have my reasons not to trust those numbers. 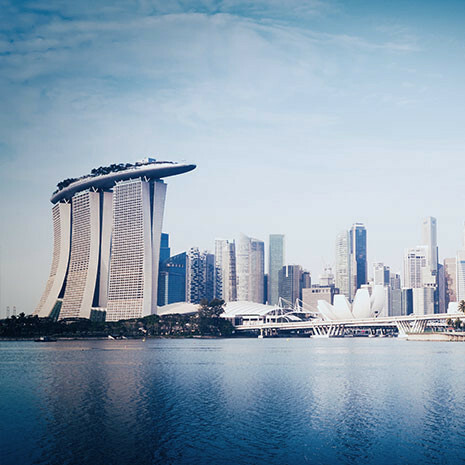 Hong Kong net imports can also be explained by the fact many gold brokers in the world offer vaulting services in Hong Kong (GoldSilver, GoldMoney, etc). In 2013 Malca-Amit Global Ltd opened a vault in Hong kong, with a capacity of 1000 metric tonnes, which can be used by investors worldwide. This is why Hong Kong net import isn’t solely Chinese demand. Let’s put together some data and try to work out how much gold the Chinese people and the central bank have been accumulating in the past decades. In exhibit 5 we found a clue suggesting China has probably been a net importer since the nineties. 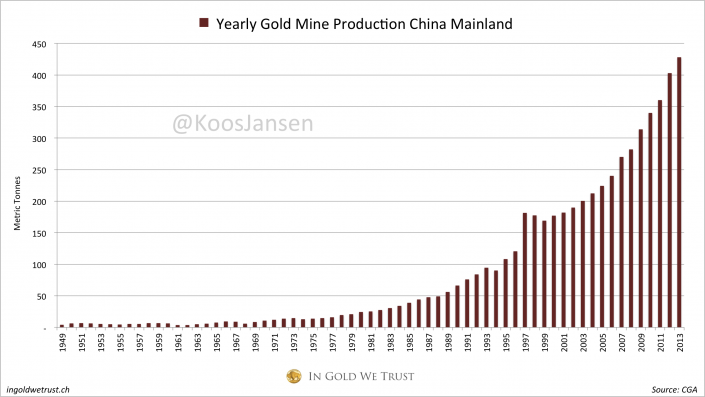 This means we don’t know how much of the gold China domestically mined prior to that period has been exported, but after, lets say, 1995 all domestic mining did not leave the mainland. 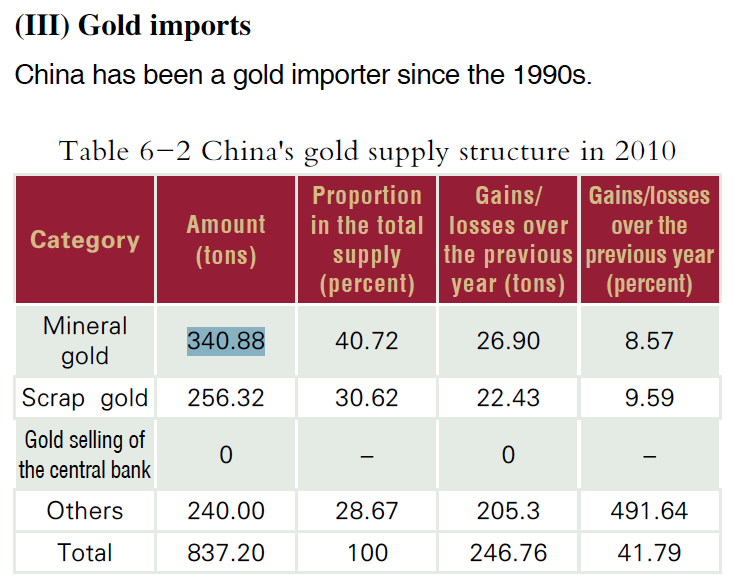 My best estimate of how much gold was being held among the Chinese population in 1995 is 2500 tonnes, according to Albert Cheng from the World Gold Council (page 55). Starting from that year I will try to make a conservative estimate on how much gold the Chinese have been accumulating. According to the PBOC their official reserves in 1995 accounted for 394 tonnes, Chinese mines produced 108 tonnes that year; our starting point is 3002 tonnes (2500 + 394 + 108) in 1995. Subsequently I added yearly domestic mining, cumulative, as the Chinese didn’t net export any gold since that year. In 2001 The PBOC announced their official reserves had increased to 500 tonnes and in 2003 they announced having 600 tonnes. Because the gold market wasn’t fully liberalized in those years I have subtracted these gains from cumulative domestic mining. Just to be on the conservative side, also because I have zero trade data from 1995-2001. The official subsequent update to 1054 tonnes by the PBOC was in 2009, when the gold market was fully liberalized. This gain I didn’t subtract from cumulative domestic mining, as I believe this was imported monetary gold. The increase in PBOC holdings from here on is pure guessing, though I feel comfortable raising their holdings to 3500 tonnes in 2013. – Mainland tourist buying jewelry in Hong Kong and storing it locally or bringing it home. – Potential gold smuggling via tunnels from Hong Kong into the mainland. – Undeclared gold import by affluent Chinese circumventing all authorities (customs, SGE). 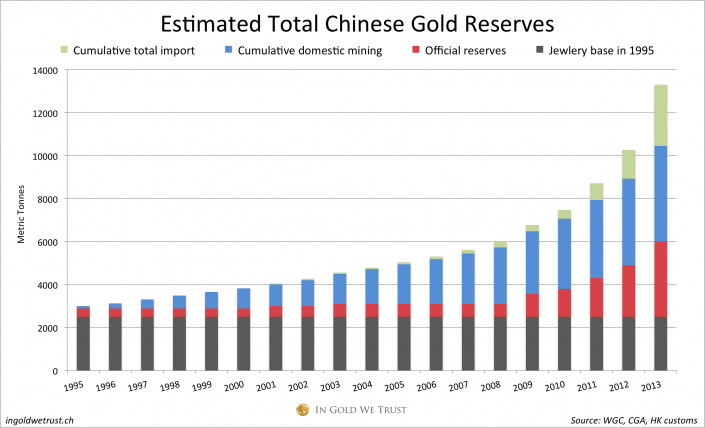 Taking this into account it’s safe to say there is now more than 14000 metric tonnes of gold in China mainland. Divided by 1.3 billion people that’s 10.7 grams of gold per capita. Ordered 7 times last 7 days!